My mother grew up on a farm in South Eastern Missouri, until she was about 7. Then they all of them, 8 kids and 2 parents, moved to the city. Changed their ways, gave up the chickens, and lived in apartments. Forever, for some of them, like my mother. For her 2 oldest bothers--they must have been 14 and 13 at the time of the great exodus—-it as the opposite: they spent much of their lives trying to get back to the farm, no matter how far afield (2 years in Germany; an eternity in Southeast Asia) life took them, or how successful they became. I spent the summer I turned 12 (or 13?) on the younger brother’s farm, 50 miles away from the one he and my mother, and all the other siblings- had left 25 years before. By then my uncles was on to his second wife, Idele, a computer scientist who taught part time at the local community college when she wasn’t writing theoretical papers on Artificial Intelligence. She had the first computer in town, and she liked to crochet lace to keep her hands busy while watching TV at night.. My uncle, Paul, raised cattle, but couldn’t bear to send the blind ones (Garibaldi) or the overly sweet ones (Dawn) to market. Paul took me fishing, and I watched Idele can 50 jars of Tomatoes, and she tried to teach ye to knit but I thought it was for old ladies, and I accidentally bid on a cow at the livestock auction we stopped at to cool off after they bought an antique organ. They had rows upon rows of corn, and the best salad. Idele grew bee’s balm to help pollinate the patch of flowers she kept for cutting before visiting my aunts and grandmother in the city. Paul and Idele divorced 3 or 4 years later, and my uncle moved back to the city, and resumed his career. Married another woman and had another family. I think Idele died about 5 years ago. 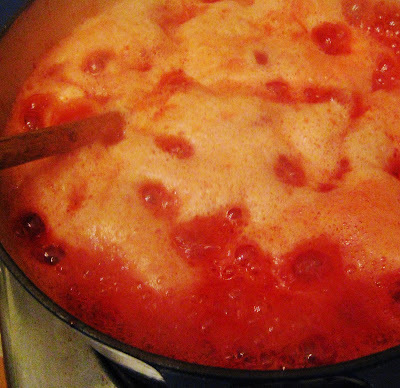 I’ve been thinking about her in fleeting moments this summer, as I poured jam in to jars, and last night, when I wove in the ends of the scarf I knit for j.
Chop fruit and pour into a large stock pot, stir to mix. Add sugar, lemon zest and lemon juice and stir to coat. Let sit for an hour or until juice forms. Once liquid has formed bring mixture to a quick boil. Reduce heat and cook for 20 minutes or until the fruit starts breaking down. Mash the fruit intermittently. 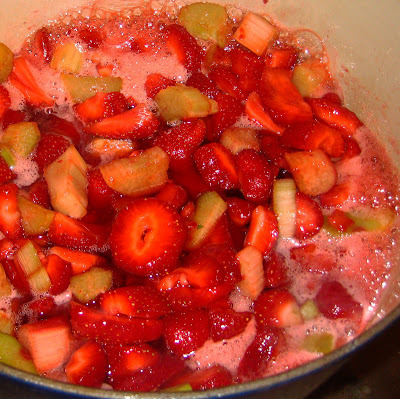 Remove from heat, and scoop out 1-2 cups of the fruit into a glass bowl. Whisk pectin and calcium water into the 1-2 cups. Once it is well-combined, pour it back into the kettle/rest of the fruit, and whisk the whole thing until well combined. Let it cool another 10 minutes or so (not too long or it will be stuck in the pot), and transfer to jars. This makes about 5 cups of jam. 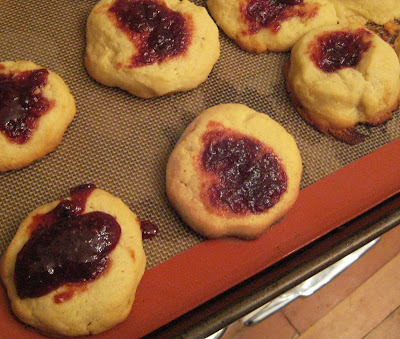 I use what doesn't fit into my jars to make thumbprint cookies (this recipe was great).